Flow deeper into your practice by taking this internationally recognized 200-hour Yoga Alliance Certification in Hatha, Vinyasa Flow yoga and / or basic massage intensive. Submerge yourself in a new culture, in paradise, and leave this program with a thorough understanding of massage and yoga, what it means to you and the healing it can bring to others as a day-to-day physical and mental practice. You will stay at Extreme Hotel in a double or single room. This yoga program covers pranayama (breathing), anatomy, history and philosophy, and the energetic, subtle body. This mentorship program will step you in yoga and massage as a way of life and springboard you into a new career in your hometown or abroad. Basic massage skills include terms, tools, and techniques to give proper relaxing massages. The basic massage intensive will start from May 21 to 30 and the teacher training will start from June 1 to 21. Laurie Searle, also known as Lady Yoga, has been teaching yoga (E-RYT 500), Pilates, fitness training (NASM), and massage for almost two decades. She also leads teacher training nationally and internationally through the Sphota Yoga School and is the founder of F.E.D. (fight eating disorders), a non-profit, tax-exempt organization offering assistance for those suffering from eating disorders. Laurie is also the creator and writer of the comic strip, "Lady Yoga", superhero featured monthly in LA Yoga Magazine, Miami Yoga Magazine, and online at MyYogaScene.com. 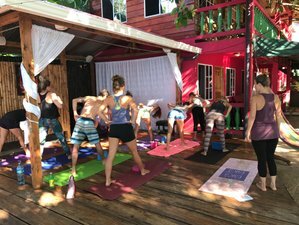 Firefly Yoga & Massage is located in the jungle, steps from the Caribbean Sea, on the grounds of Little Corn Beach and Bungalow. They offer daily one-hour yoga classes.